The Hôtel Scribe Paris Opéra stands as one of the city’s most prestigious hotels. Its sparkling reputation began when the Jockey Club de Paris decided to use the first two floors of the building as their headquarters in 1863. Legendary figures like Marcel Proust, Jules Vern, and Sergei Diaghilev have all resided at the hotel at one point. 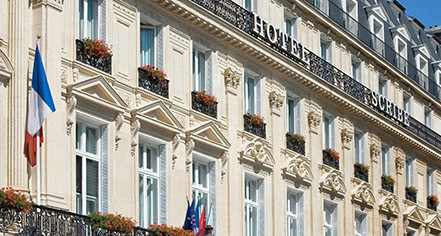 Sofitel now manages this fabulous historical treasure as the Hôtel Scribe Paris Opéra in honor of its storied legacy. For a grand vacation in the heart of Paris, look no further than the Hôtel Scribe Paris Opéra. Sofitel has brilliantly transformed the hotel’s 213 accommodations into wonderful sanctuaries that guests will find irresistible. Luxurious amenities fill these splendid rooms, and modern creativity blends well with authentic French cuisine at Le Lumière. Guests will also relish time spent at the Keiraõ Spa. And the Hôtel Scribe Paris Opéra possesses 18 meeting venues that guests can reserve for any event regardless of its size. The Hôtel Scribe Paris Opéra is nestled within the 9th arrondissement, one of the most vibrant neighborhoods in all of Paris. Known historically as the “Opera District,” the area possesses cultural institutions that attract thousands of visitors every year. Guests can explore these local destinations from the hotel, including the array of opera theaters and concert halls. Hôtel Scribe Paris Opéra is also situated near several excellent shopping centers that feature some of the finest storefronts in Europe. The majestic Seine River and its magnificent UNESCO World Heritage Site are just a stone’s throw away! Allow for the Hôtel Scribe Paris Opéra to serve as a springboard for an exciting journey into this fantastic Parisian community. Many remarkable historical events have transpired within the hallowed walls of the fabulous Hôtel Scribe Paris Opéra. Among them include the showing of the world’s first cinematic screening in 1895 with a device known as a cinematograph! Hotel/Resort Fees & Taxes: A tax is imposed by the city: €3.3 per person, per night. This tax does not apply to children under 18 years of age. Parking: Public parking is available at a location nearby (reservation is not needed) and costs EUR 40 per day; valet parking available. Rollaways: Rollaways are available for EUR 105.0 per night. The Hôtel Scribe Paris Opéra stands as one of the city’s most prestigious hotels. Its sparkling reputation began when the Jockey Club de Paris decided to use the first two floors of the building as their headquarters in 1863. Legendary figures like Marcel Proust, Jules Vern, and Sergei Diaghilev have all resided at the hotel at one point. 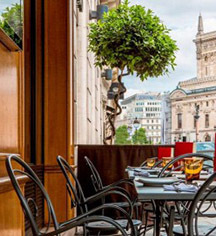 Learn more about the History of Hotel Scribe Paris Opera By Sofitel .